The $200.00 bonus will be credited to the qualifying checking account within 10 days of the date the last requirement is met. Your account must be open and in good standing at time the bonus is awarded. Limit one new Select Business Checking, Premier Business Checking or Community Business Checking, per membership and per EIN/SSN, will be eligible for the bonus. Offer valid for new Select Business Checking, Premier Business Checking or Community Business Checking accounts only. The $200.00 is considered a bonus and is subject to IRS reporting. The account must be opened between 04/01/2018 – 12/31/2018 and remain open for at least six months. If it is closed within 6 months of the open date you may be responsible for reimbursement of any bonus awarded. 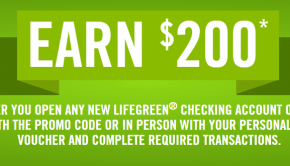 They also offer a $200 personal checking bonus. Unlike that account/bonus, it doesn’t look like these can be opened online. If you live near a branch this still seems like an easy bonus to complete. I’ll be adding this to the best business checking bonuses because the requirements are easy and it’s not difficult to keep the account fee free either but again only really worth doing if you live near a branch. I’ve banked with Vantage West since 2015. It’s a soft pull on EX to join, but definitely a Chex pull/inquiry for any new account. I joined with a pre-qual for a Visa and just opened the required share savings account, a year or so later I opened a checking account and it was a pull/inquiry on Chex even though I already had a savings account. If you don’t want to keep $500 in the account to avoid the monthly fee, get the Select Business Checking account and use your debit card for purchases 10 times per month. Strict with chex systems. Denied in branch today in Phoenix. Branch manager said that she can’t override the system. 550 score. Community checking is only for non-profit organizations, barely a difference though.